The tent is for 10-16 person . Usage: fire emergency rescue, flood relief, field construction, army camp, field hospitals, temporary office, entertainment, leisure holidays, etc. 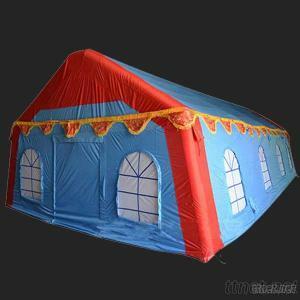 The tent is in the form of gas column frame, gasbag with nylon choreography PVC double-sided coating of high frequency welding thermal forming, electric pump fast filling molding.The structure is simple, folding, good stability, wind resistance, uv resistance, waterproof and fast molding, wind resistance level 6 ~ 8, the optimum temperature range - 30, the hydrostatic pressure p 16 kpa, surface water from 160 to 200 mm, aeration time 10-15 minutes (tents set up complete). Mainly used in military, medical, emergency disaster relief, fire control, etc. Gas column frame structure with polyester fabric with PVC coating, is made of thermal bonding or adhesive bonding forming has a high tensile strength, good air tightness, light weight, convenient to carry. Products modelled on the international popular design style, reasonable structure, convenient assembly, good wind resistance, waterproof thermal insulation, moistureproof prevent mosquito, and many other advantages. Distinctive features: easy to carry, fast filling molding pack, light weight, soft framework without hard objects is single carry, can be living people. The folding tent packed into bags. Open the package when using flattening corners, can to 10 to 15 minutes to shape. Gas column pressure value can keep normal 24 hour, 7 days not lodging. Add to drill and a fixed rope, stronger ability to resist wind.